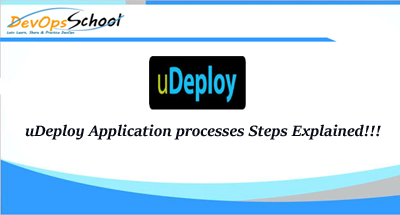 uDeploy Application processes Steps Explained!!! Application processes, like component processes, are created with the process editor. UDeploy provides several common process steps. Also, application processes are assembled from processes that are defined for their associated components. When a component has several processes, the “application steps” order determines which ones run and in which order. Install Component: This step installs the selected component with one of the processes that are defined for the component. Uninstall Component: Use this step to uninstall the selected component. Rollback Component:- Use this process step to roll back a component version to the version in a snapshot or to the version that was deployed when the process began. Run Process for Each Version:- USe this step to run the specified process once for each version of the specified component. Apply Configuration:- Runs a component process of the type Operational (No Version Needed) or Configuration Deployment. Install Multiple Components:- Install multiple components that are based on component tags or resource tags. Uninstall Multiple Components:- Use this step to uninstall the selected components. Run Operational Process for Multiple component:- Runs the specified operational (no version needed) Multiple component process. Rollback Multiple Components:- Use this step to roll back multiple component versions to versions in a snapshot or to versions that were deployed when the process began. Run Generic Process for Each Affected Resource:- Runs the specified generic process on each resource that is affected by the application process. Inventory Update:- This step updates the inventory and compliance for the environment. Finish:- Ends processing. A process can have more than one Finish step. All processes must reach a Finish step to complete successfully. Run one of these components processes. You can run a component process as a part of a step. Acquire lock: This step acquires a lock on a specified string value. You can use locks to prevent concurrent modification of resources. Release lock: This step releases a lock on a specified string value. Set Status: This step sets the ending status of the process. The step can specify that the process is completed or failed. Switch: Use this step to create branches in the process that are based on the value of a property. Join: The Join step merges a process so that only one step runs at a time. If any of the steps that connect to a Join step fail or do not run, the Join step causes the process to fail. Note: The Note step adds a note to a process diagram. Run Generic Process: This step runs a generic process as a step in an application process. Manual Application Task (Utility): A manual task interrupts an application process until manual intervention is done. A task-interrupted process remains suspended until the targeted user or users respond. Typically, manual tasks are removed after the process is tested or automated.